The beating and robbery of a man near SF State is investigated as a hate crime. 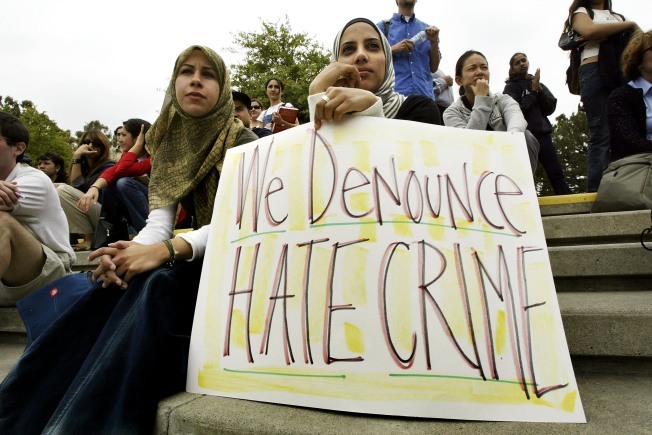 A beating of a 20-year old man near SF State is being investigated as a hate crime. Police are investigating the beating and robbing of a 20-year old man near San Francisco State University early Wednesday as a hate crime, according to reports. The man, who is not identified, as walking near Font Boulevard and Tapia Drive at around 2:10 a.m. when three suspects in a vehicle approached him and began shouting homophobic slurs, according to the San Francisco Appeal online newspaper. Two suspects exited the vehicle, a four-door, cream-colored Oldsmobile sedan possibly from the late 1970s, and kicked and punched the victim while a third suspect stole the his smartphone, according to police. The suspects fled. The victim suffered minor injuries but did not require hospitalization. One suspect is a black man, 20-25 years old, 5-foot-9, 140 pounds. He had a goatee, an olive-colored button-down shirt, and a beige bandanna, police said. Another is a white man, 5-foot-10, 150 pounds, with a "high-and-tight" military-style haircut, wearing a gray hooded sweatshirt and baggy blue jeans. The third is described as Hispanic, 5-foot-8, 160 pounds, wearing a tan shirt and baggy pants. Anyone with information is urged to call the anonymous tip line at (415) 575-4444 or texting TIP411.